Sara Ali Khan shows how to vacay like a star! 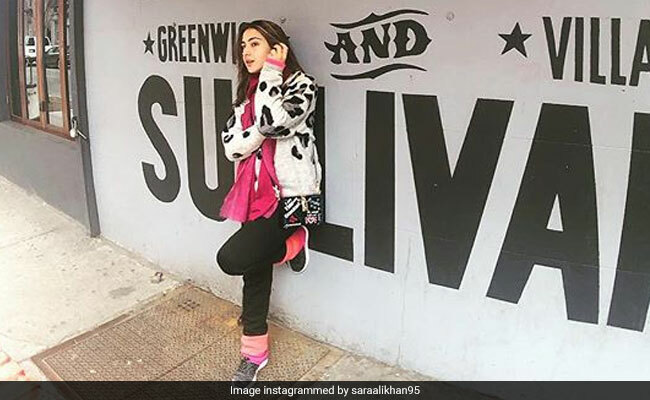 Sara Ali Khan has been painting New York red for a while now and Manhattan is where she made a pit stop recently. While Sara Ali Khan added the disclaimer that she may have the soul of a wanderer but she is not a lost one. "Not all those who wander are lost," she captioned her new set of photos with a borrowed line from JRR Tolkien's poem All That Is Gold Does Not Glitter, which features in his book The Lord Of The Rings more than once. The allegorical poem suggests the flipside of Shakespeare's (Hamlet) words: "Not all that glitters is gold." However, in Sara's hashtag, we spotted a confession by her: "Major mumma missing," she wrote. Looks like Sara Ali Khan's New York diaries are incomplete without mother Amrita Singh. Sara is the daughter of Saif Ali Khan and Amrita Singh, his first wife. In the new vacation photos, Sara can be seen layered up like a true blue New Yorker in white and pink and black. In one of the photos, a morose Sara can be seen waiting in front of a graffiti that reads: "Found child. Will wait in Louis Vuitton." Lol. Sara may be in Manhattan but that's so Upper East Side! Sara Ali Khan is actually touring New York as promotional duty for a travel website. Earlier, she filled up her Instagram with her favourite memories from the trip (which also includes her best friend) and wrote: "My favourite spot on this planet is wherever I get to see you." We also spotted Sara Ali Khan shopping and "just wandering in the city of dreams." Sara Ali Khan's New York trip comes as a break from the shooting of the sequel of Love Aaj Kal. So far, Sara is two-film-old in Bollywood with Kedarnath and Simmba.